For the last 12 months we have been actively exploring how Microsoft’s Business Intelligence product called PowerBI could be used at St Andrew’s College. I have blogged about our initial experimentations with this here and that post would be a useful piece of pre-reading to provide context to this post. Ease of access – using their existing school username/password to access the report on any device with a browser and anywhere (they are not restricted to being on the College campus). The collation of disparate data presented in an easily comprehensible, highly visual format. Previously, to obtain information on attendance, NCEA results, discipline and Fortnightly Notes would have required dozens of clicks, different windows and reports, and even using different platforms (both Synergetic and Sharepoint). Speed – the reports load very quickly in the browser. It is satisfying to hear this type of feedback given the significant level of investment and effort that has been made in developing this platform from where we were 12 months ago. For some understanding of this journey from Crystal Reporting through to PowerBI, the following video is a quick version of a presentation Mr Dave Neilson and I gave at the Association of Independent Schools of New South Wales’ annual ICT Leadership Conference 2016 in Canberra in May. The theme of the conference was Supporting Digital School Improvement and you can download a copy of the slides from this presentation here. Developing an on-premise data warehouse and using ETL processes to extract data from various sources before loading into a tabular data model and connecting to the cloud via SSAS Gateway Connector. This is also very secure when implemented with row level security. It is easy to access – teachers can use their existing school username/password so there is limited barriers to entry and it is accessible via a browser from any device. Visualisations of data are excellent. The ability to transform what was previously stored in spreadsheets and rows and columns of data into easily comprehensible displays is critical. There is a range of default visualisations as well as third party generated ones. Time to talk! The power of a visual to highlight a student trending in the wrong direction. With the release of the Tutor Quadrant Report, planning is already underway for the development of further reports for both teaching staff as well as administrative staff. The migration to PowerBI of an existing Tableau report that our Director of Development used has been completed and this enables her to now access data refreshed daily and drill down using the self-service elements of PowerBI. Pleasingly, she has already identified a number of enhancements she would like to see – this is something we anticipated would occur once the end users started getting more meaningful access to the data. Additionally, rebuilding a very detailed NCEA report similar to what we explored in the original proof of concept will be important for academic staff to monitor progress as the year progresses. Ideally, we should see some accelerated development now that the backend infrastructure is in place. Lastly, there is rapid development happening on the PowerBI platform all the time. One of the most exciting developments is the ability to embed reports into an existing website or portal and even apps, opening up a huge range of possibilities where we could securely share reports like those above with students and parents. For now, that is in the medium to long term planning, as we focus on rapidly deploying further PowerBI reports for the College staff. This week I was excited to receive correspondence from David Colville, from DataCom Australia. He was present at the 2016 Future Schools Expo in Sydney. His request was that a group of St Andrew’s College students could be made available to share ideas with small groups of students from Mount Sinai College, Sydney. These students had been taking part in one of four future challenges as part of the Maker’s Playground of this conference. There was a tornado in Sydney last year. Some houses were destroyed. What sort of house could survive a tornado? We know that you learn better at school when you are happy, but some times you come to school sad because you might have had a fight with your brother or got told off by your Mum. How can we cheer students up when they get to school so they are ready to learn? We love Lego, but cleaning up the pieces and finding the right one can be difficult. Is there a way to sort Lego pieces out quickly and make packing up our lego kits more effective? We don’t have enough refs for our netball games. How can technology help our shortage of refs? After a quick bit of organisation from preparatory school eLearning expert Wilj Dekkers, it was decided that our recently formed Year 8 Gifted and Talented group would be perfect for this opportunity. This group are working with Mrs Julie Rogers as part of the College’s GATE program. With only a few minutes preparation time afforded, it was great to see this small group of students independently agree to use the Collaboration Space on a OneNote Notebook, set up a dedicated area of this space so that they could collaborate on their ideas during the Skype Call, and then test the functionality of this space. This setup was all done independently of any teacher input and took only a few minutes. The structure of the Skype conversation was simple. A small group of Mount Sinai students explained their solution to one of the problems described above, and the St Andrew’s students responded with their critiques, ideas and encouragements. During the activity the students from both school were extremely engaged. They listened carefully to the input from all students and the questioning and reasoning on show was impressive. This activity was a really great example of students, in two different locations, displaying their collaborative and teamwork skills in an unfamiliar setting. 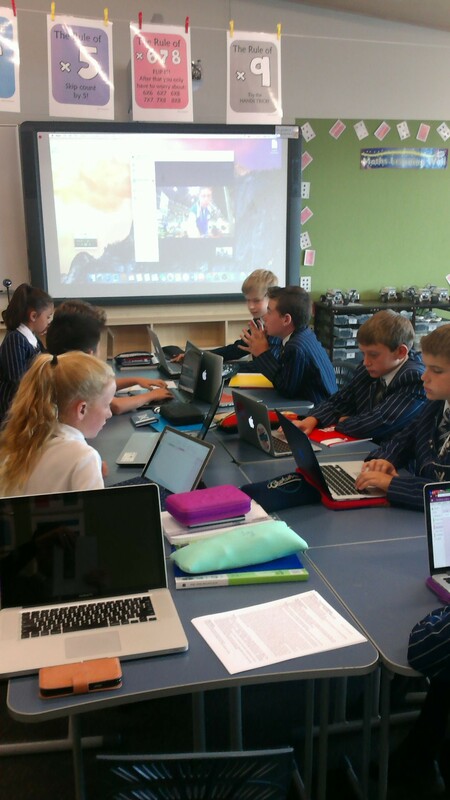 Here, at St Andrew’s College, we enjoying using Skype to connect with other Educators or Students across the globe. We have enjoyed a number of Mystery Skypes, have engaged with a children’s author, and brought experts into the classroom. We all look forward to the next opportunity to use Skype to help complement the other great learning that occurs in our classrooms! Increasingly, most organisations are seeking to “do more” with the data they collect and store and in this respect, St Andrew’s College is no different. For the last two years I have been looking at a number of tools that would allow us to easily collect, analyse, display and share critical information amongst key stakeholders. A custom Crystal Report showing a student’s Fortnightly Notes score. It’s browser based – you can access it from “anywhere” and see live data. You can also bookmark certain reports in your browser for near instant access. It’s part of our existing Office365 Suite, so our existing username/password logs you into the reports. Security permissions are centrally managed based off AD users and role based groups. It connects to our on-premise MS-SQL Server, allowing for scheduled data updates (hourly / daily). Note: identifiable data such as student names / ID numbers have been blurred out in this video. Partnered with DataCom New Zealand and are getting expert advice from their Business Intelligence team in terms of configuring the ETL process via Microsoft SSIS, building a tabular data model and connecting to PowerBI in the cloud for presenting the data to staff. Hired a new staff member to join the ICT Services team in the role of Business Intelligence Report Writer. The responsibilities for this role will be to interface with the various business units in the College (e.g. Academic Data, Enrolments, Development, Communications etc), understand their reporting requirements and then build the reports in PowerBI. This visualisation could be very useful in mapping where our current students or Old Collegians live or identifying where donations are coming from globally mapped either by volume or value for example. We are in the very early stages of this project, yet the potential is very obvious to the leadership teams at St Andrew’s. The focus over the next few weeks will be configuring the backend infrastructure: the ETL processes (Extraction, Transformation, Loading), the Data Warehouse and the connectivity into PowerBI. Subsequently, the rapid development of reporting dashboards will proceed. If this interests you, please do check back regularly on the blog for updates or drop a comment below to discuss further.